Evgenia Medvedeva had her school exams and plans to enter the sporting University. Congratulations on graduation from school. Something surprised, touched at the graduation? – I was not surprised by anything, because I knew that the Sambo School 70 is one big family and that we will always support each other. A lot of graduate students look just amazing today, their eyes light up and I think that’s how it should be in our big friendly school. And all the teachers who have been helping us during these long years also look at us very kindly. You had a self-study program, do you know some of your classmates? – I don’t know all the guys from our school closely. I have good friends, but unfortunately, as faith has it, I don’t know all of them, but I always felt support. Every time when we arrived from competitions, we were always greeted at the airport, congratulated, told how the guys worried about me. It’s very pleasant and always helped me. What about Uniform State Exam? – I passed it well. Even though the preparation was in such a busy schedule. 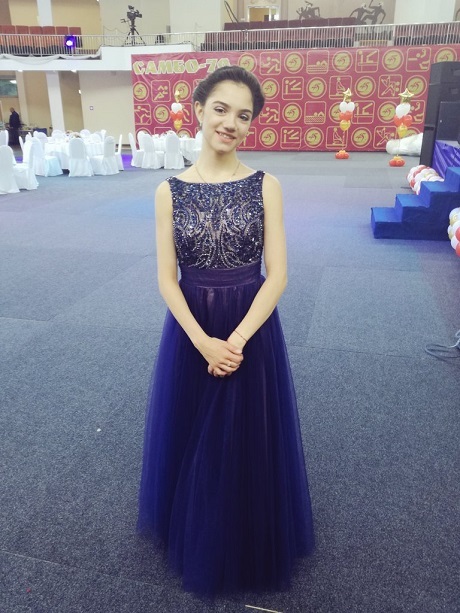 Yes, I was worried that there would not be enough time to prepare, but everything ended well, because the teachers were constantly adjusting to my busy schedule and even went to our distant base in Novogorsk before the exams, this support was very important for me. Will you have some kind of prom? – Just right now I’m going back to our base in Novogorsk, where we have a training camp and work, work and work. Probably, for me this is the greatest reward that I have the opportunity to fulfill myself and continue to work day in and day out. Because for me, sport is my life. And I hope that I will succeed in further glorifying the name of our school Sambo 70. Are you planning enter some university? – Yes, I’m planning to enter a university, a sporting one. I’m just here for the dress. I think she wore it at one of the banquets before; I just love the color, she looks like a princess. Congratulations! I’m glad that she’s going to a university, but what’s a sporting university? I don’t think we have that type of uni here… Do they only study sport-related subjects there? Or is it like a common university but more adapt to atheletes’ schedules? It’s a university where you study to be a coach.